Gas (1940) by Edward Hopper. The brightly-lit station seems like a last welcoming oasis along a road to impenetrable darkness. Hopper's Gas is a study of isolation in Truro, Massachusetts, portraying a petrol station standing on its own in the impending darkness. The darkness that spreads like a fog from the right of the canvas, a harbinger of fear, contrasts with the security of the building. 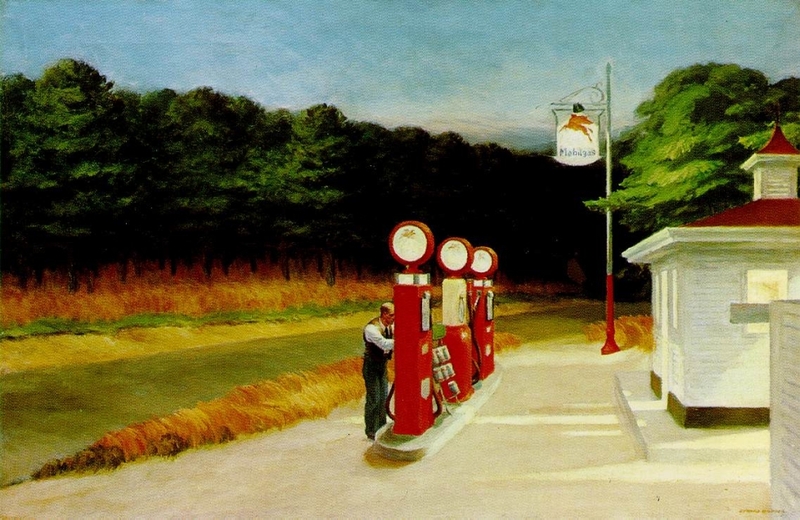 A lone attendant adjusts a nozzle at this deserted rural filling station; the lanky figure (not unlike that of the artist) echoes the form of each pump, whose progression in the center of the canvas leads the viewer down the empty country road.